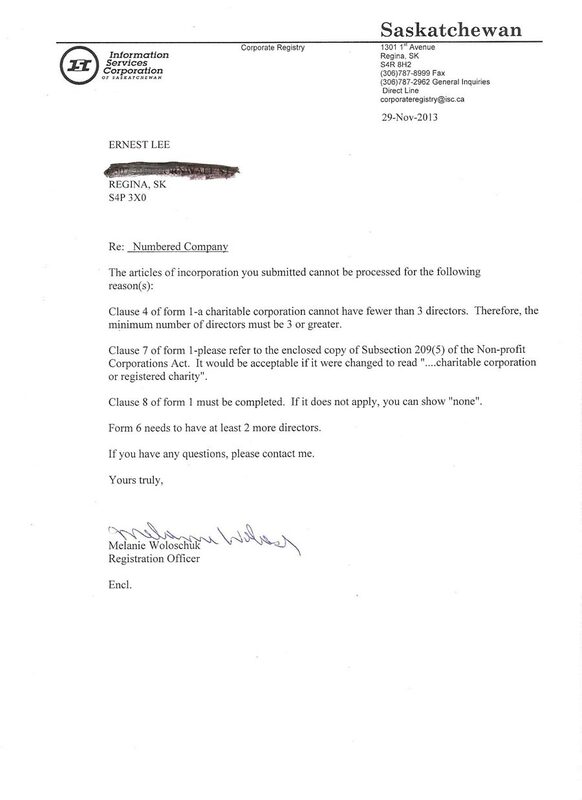 Web readers are asked to review ABOLITION OF RMS, note my (Lee)s reference to post MONEY-MONEY-MONEY to be in-site January 2014, using a numbered non-profit company to ask for annual $20.00 donations from the Urban households to maximize advertising of this Website on Access TV BUT l was not able to get that done, note letter below from Information Services Corporation (ISC), listing the short coming in the material filed with them. Web readers are asked to review SCHILLER ON STUPIDITY, scroll down to the document, my (Lee)s ask of Canada Revenue Agency (CRA) for permission to establish a tax exempt non profit, CRA has not responded, so I plan to go ahead asking for $20.00 donations with out being able to grant tax deductible receipts. You are currently browsing the Rural Zoning in Saskatchewan blog archives for December, 2013.